After nearly 20 years, the Palestinian Authority, the PA, has achieved the dubious reputation of being one of the largest recipients of foreign aid per capita in modern times. However, the PA has not achieved stability, democracy, transparency, or accountability. One the most corrupt regimes in the Middle East, the PA remains a fiefdom, at this point in time under the control of chairman Mahmoud Abbas, his sons, and his cronies. Throughout the course of 2012, a pattern was established in which senior commanders were increasingly allied with organized crime and renegade militias. In many areas, PA security presence has dwindled as personnel and commanders- trained for the most part by the US-have been recruited by organized crime groups engaged in extortion, as well as in the smuggling of weapons and narcotics. In Jenin alone, this has been the case with scores of PA officers, as evidence mounts of similar phenomena in other cities under PA control, including Bethlehem, Hebron, Nablus, and Tulkarm. This situation was exacerbated in the latter part of 2012 by a fiscal crisis. As monthly salaries were withheld or only partially issued, many PA security personnel, with the consent of their commanders, clocked in and then went off to other jobs, often in the employ of private security agencies or for local criminals impressed by their Western training and equipment. Having benefited from major donations from such nations as Iran and Qatar, Hamas has been in a position to exploit the financial crisis of the PA. Numerous PA security personnel have been quietly engaged to working for the Islamist group, particularly the military wing Izzadin al-Kassam. Hamas penetration into PA security has been strong in several areas under ostensible PA control, particularly in the Hebron region where senior PA intelligence officers are believed to provide intelligence to Hamas. The PA security services now allow Hamas to organize huge rallies in areas under PA control. This arrangement, a departure from earlier policy, enables Hamas to openly recruit members as well as to mobilize supporters, as efforts are made to restore the Islamist military infrastructure in areas under PA control. Most of these rallies have ended up as confrontations with the Israel Army. Senior members of the ruling Fatah movement have touted Hamas’ war with Israel and called on the PA to prepare for another uprising in areas under PA control. Fatah, in statements reported in official PA-run media, has already announced the establishment of units assigned to fight the Israeli Army. As a function of Abbas’ unilateral push for a state, PA security cooperation with Israel sharply declined in November and December 2012. Palestinian officers facilitated and even aided Hamas-aligned attacks on Israeli civilians and soldiers. In some cases, PA personnel have attacked Israeli soldiers in broad daylight. PA security forces have also tried to stop the Israeli Army from capturing suspected Palestinian insurgents. The Israeli army has privately acknowledged that Palestinians involved in attacks on Israelis have been allowed to join PA security forces and receive U.S. training. 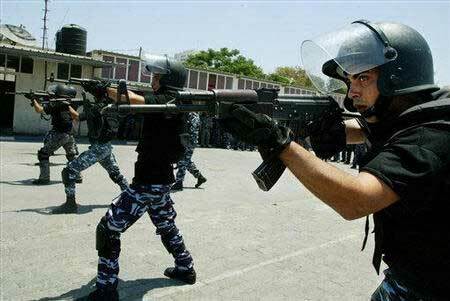 · Abbas uses the PA security forces for his own purposes. Abbas has used PA security forces: to retaliate against critics who accuse him of corruption; to destroy or exile his rivals in Fatah; to pursue Palestinians who have sold land to Jews; and to stop Jews from reaching religious sites in the Nablus region. · None of the above issues has diluted solid Western support for Palestinian Security Forces. Under President Barack Obama-who seeks to expand PA paramilitary units-the United States has pledged to continue to pour hundreds of millions of dollars a year into Abbas’ coffers, with large sums dedicated to the security forces. This is despite objections from Congress and appeals by Palestinian human rights organizations. Obama has exercised waivers to continue to fund the PA security forces. American-trained PA Preventative Security Force 2013. The PA intelligence agencies, initially be limited to six, were quickly adopted by foreign sponsors, including the UK, Egypt, France and the United States. There was, however, little oversight of the forces, which engaged in extortion of Palestinians and received commissions on major deals in the West Bank and Gaza Strip. Without oversight, PA units became involved in attacks against Israeli civilians and soldiers. In September 1996, PA security forces clashed with the Israel Army throughout the areas under PA control in the wake of Israel’s opening of a tunnel contiguous to the Temple Mount. Four years later, Arafat recruited security forces to organize ambushes and other attacks on Israeli civilians and soldiers in what was called the “second intifada”. The Israeli military responded with Operation Defensive Shield. By the end of 2002, the PA security forces were decimated, with facilities demolished and weapons seized. The United States recruited NATO and other partners to restore PA security forces. Yet despite pledges of hundreds of millions of dollars, the Palestinian security forces remained fiefdoms and ineffective. Amid White House assurances to the US Congress, PA security forces were overwhelmed by Hamas fighters, who took over the Gaza Strip in 2007. 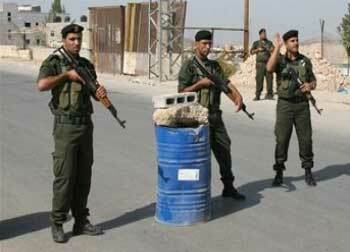 The PA defeat led to an overhaul of Palestinian security forces in the West Bank directed by the office of the U.S. Security Coordinator (USSC), established in 2005. The Coordinator-supported by such countries as Britain, Canada, Denmark, Finland, Germany, Greece, the Netherlands and Turkey-reports directly to the secretary of state and oversees security aid to the PA as well as cooperation between Israel and the PA-administered areas. The U.S. goal is to assist in the establishment of an independent Palestinian state under the control of Abbas and the Fatah. The U.S. strategy for achieving this goal began with the rebuilding of the PA security force structure, infrastructure, equipment and training. The most influential U.S. official involved with nurturing the PA security forces was Lt. Gen. Keith Dayton, who served for five years in the post of Coordinator. Dayton, alone among his peers, was involved in PA operations, training, appointments and even deployment of forces. To the consternation of senior Palestinian officials, the U.S. general established a system of rewarding those individual commanders who cooperated with him and worked to secure the dismissal of those who did not. As a result, PA commanders followed Dayton because of either a personal or political agenda, or because they wanted their units to receive American equipment. One Palestinian critic who lost his position as a result of criticizing Dayton was Col. Tawfiq Tirawi, then chief of the General Intelligence Services. The European Union has been training PA police, with more than 3,000 personnel trained via Britain’s Hart Security. Over the last two years, EU focus has been on developing Special Forces, with France overseeing the training and equipping of Special Forces for site and diplomatic security. The three-week course designed for this – referred to a “train the trainer” – has been sponsored by France’s Compagnies Republicaines de Securite. This is a program that has sought to develop indigenous PA security capabilities. French instructors have taught PA police such skills as public order, defensive tactics, communications, and crowd control. In 2005, Abbas reorganized the Palestinian Security Services into six main units. s the Preventive Security Apparatus. Abbas, under a policy that called for mandatory retirement at age 60, also dismissed veteran commanders in the PA and replaced them with younger and more modern-thinking personnel. 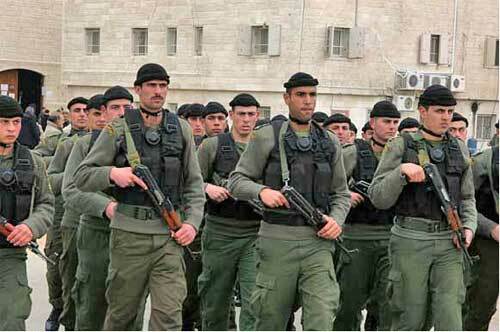 The PA Interior Ministry reduced the number of armed personnel by 90 percent, as of the end of 2010. However, aging commanders loyal to Abbas remained. Indeed, the ruling Fatah movement has not lost any of its influence over the PA security forces. Despite efforts by Prime Minister Salam Fayyad to professionalize the security forces, some 80 percent of all officers were either Fatah members or affiliated with the movement. The commanders of all six major agencies have been members of the Fatah Revolutionary Council, regarded as the monitoring body of the movement. The Interior Ministry, which oversees much of the security forces, is also dominated by Fatah members. The commanders of all six major agencies have been members of the Fatah Revolutionary Council, regarded as the monitoring body of the movement. The civil force of some 8,000 remains the least affected by the halt in PA salaries. Most of the members of this force are young men who still follow orders of their superiors and believe the promises that Arab states will end the fiscal crisis in Ramallah. This force, the first to reappear in the West Bank after the second uprising in 2000, has been under the tight control of Brig. Gen. Hazem Atallah, who regards the financial crisis as a key challenge of his command. Although salaries are still forthcoming for this force, the crisis has affected operations in other ways. Fuel has been at a premium, thus limiting the reach of PA police operations. Plans to open and maintain police stations in rural areas of the West Bank, particularly in the north, have also been hampered. This U.S.-trained unit of nearly 10,000 officers has been significantly hurt by the fiscal crisis. Training of NSF personnel declined and corruption rose significantly in 2012. The problem has been compounded by the fact that at least 20 percent of the force was meant to protect the regime against plots within PA security units. The intelligence services have sustained less damage from the fiscal crisis than other forces. This is because several of the intelligence agencies receive funds from Western donors rather than simply from the Palestinian government. France has been helping the General Intelligence Services. GIS, which plans to train 1,200 officers in such technical skills as surveillance and data analysis, reports directly to Abbas. The United States has been pumping money into the Preventive Security Apparatus, the largest of the intelligence agencies. PSA, with 4,000 members, has led most PA counter-insurgency operations, particularly against Hamas and Jihad. Formally, PSA reports to the Interior Ministry as well as the prime minister’s office, but many of these operations remain under the supervision of the United States and are monitored by Israel. Officially, Washington ended support for PSA, but U.S. aid has been quietly channeled to PSA as part of an effort to bolster forces loyal to Fatah in case of any war with Hamas. Military Intelligence has sustained a greater decline in morale amid the fiscal crisis than the other intelligence agencies. This force, nominally under NSF, has become a factor amid the power struggle within Fatah as MI officers provide muscle for rival factions. Despite efforts at reform, MI has failed to move from a political to a professional force and efforts to coordinate with NSF have failed. almost every major city under PA control were offering police and security personnel part-time work doing everything from protecting homes to providing tips on police patrols and investigations. The biggest cases of corruption were in cities. Abbas ordered a crackdown on Fatah and PA officers in Jenin after the death of its governor, Khaddoura Mussa. He died hours after his home was fired upon, it was believed. by PA personnel. 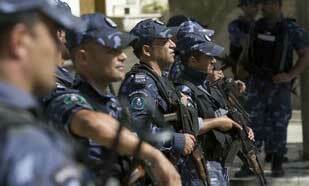 The corruption of the PA security forces has been exacerbated by the fiscal crisis in 2012. For most of the year, Palestinian civil servants received at most only a portion of their salaries and sometimes nothing. The failure to pay salaries has been blamed on Israel as well as Arab and Western donors. But many Palestinians assert that the real cause is official corruption and nepotism. Abbas has used PA security forces to retaliate against critics who accuse him of corruption. Abbas has used almost all of his forces to stop dissent. PA police have established a special women’s unit to violently disperse women protesters, including peaceful demonstrations against PSA. 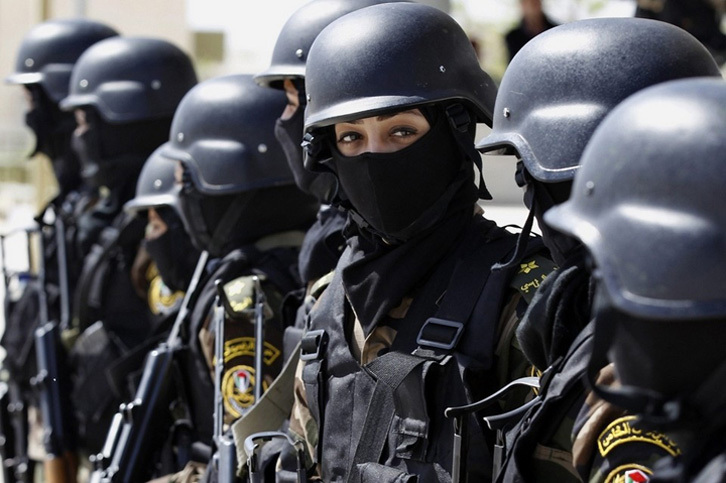 The PA women officers operate in civilian dress and were trained to kick and slap women and children as well as journalists. Abbas has used his U.S.-trained security forces to destroy or exile rivals in the Fatah. In 2011, Abbas ordered security units to attack the Ramallah home of Mohammed Dahlan, where aides were arrested, and millions of dollars worth of cars and equipment confiscated. Abbas’ feud with Dahlan goes back 20 years when Arafat appointed him commander of PSA in the Gaza Strip. The post allowed Dahlan and his cronies to gain information about corruption in the PA, including by Abbas and his family. In July 2011, Abbas arrested 15 supporters of Dahlan and purged the security forces of anybody believed to be a sympa­thizer. A month later, Fatah said Dahlan’s expulsion from Fatah was final. By that time, Dahlan and his family had fled to exile. Washington has sought to avoid dealing with the question of PA corruption and particularly the use of American aid by Abbas’ family. Indeed, critics, supported by internal U.S. reports, have asserted that a significant percentage of U.S. aid to the PA has been given in cash, in US currency. The PA presence in Jerusalem, which began immediately after Arafat arrived in the Gaza Strip in 1994, has resisted years of Israeli security and political moves to oust Palestinian troops from Jerusalem. This has included Israeli coordination with Jordan in an effort to marginalize the PA, particularly on the Temple Mount, another stronghold of PA security forces. The Palestinian Authority has used its security forces against Jews who engage in land deals with Arabs. The PSF has investigated all land deals by Palestinians to see if the buyers were Jews. PSF has arrested and detained Palestinians for agreeing to sell property in and around Jerusalem. NSF and other PA forces have also tried to stop Jews from reaching religious sites. Despite an agreement between Israel and the PA that allowed Jews to visit Jewish holy sites in PA areas, NSF and police fired toward 17 Jewish pilgrims who were leaving Joseph’s Tomb in Nablus. Under the Israel-PA agreement, the Israeli Army was to have maintained full control over Joseph’s Tomb. After numerous Palestinian attacks, including those joined by PA troops, Israel turned over control of the tomb to the PA, which in 2011 took responsibil­ity for protecting the site. However, on April 24, 2011, during the Passover holiday, NSF troops opened point blank fire on Jewish worshipers who were leaving Joseph’s Tomb, after morning prayers. An Israel Army investigation pointed to serious failures in the vetting of PA security forces, including those accepted for U.S. training in Jordan. The investigation, bolstered by witnesses, asserted that NSF officers began firing in the air as soon as the Jewish worshipers entered Joseph’s Tomb. The Jews rushed to their three cars and began to leave when five NSF officers again opened fire on vehicles. An NSF non-commissioned officer, screaming “God is great,” ran toward one of the Jewish vehicles and began shooting at close range from at least three sides. The NSF unit did not inform either its commanders or Israeli authorities of the shooting. The three cars filled with worshipers – one dead and four injured – reached an Israel Army roadblock where they were taken to a hospital. PA officers stationed at Joseph’s Tomb – identified as Mohammed Tsabana, Saleh Hamed, Wa’el Daoud, Nawaf Bani Uda and Turki Zuara – were also part of two NSF battalions in Nablus trained in Jordan by the United States. This also required Israeli vetting. There is no evidence that the US State Department, responsible for U.S. security aid to the PA, has conducted any investigation at all of the killing of the Jewish worshiper, whose mother is an American citizen. The nightmare of the Israel Army is that the PA, directed by the ruling Fatah movement, would reconcile with Hamas and begin joint operations against Jews. That is what is now transpiring. In November 2012, in the aftermath of the missile war between Israel and the Hamas regime in Gaza, Fatah and PA officials expressed admiration for Hamas and said they were ready for a serious reconciliation effort to force Israel to conduct a full retreat to the armistice lines, which existed from 1949 until 1967. 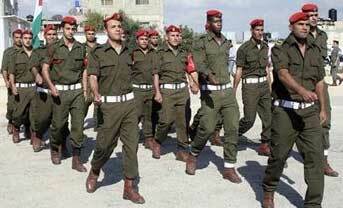 A Fatah group proclaimed that it formed a military brigade in Hebron, long a Hamas stronghold. Fatah’s military also pledged to continue attacks on Israel and avenge the assassination of Hamas military chief Jabari. The Al Aqsa statement came amid a series of declarations by Fatah leaders, including those close to Abbas, that the PA would work with Hamas against Israel. At least five members of the Fatah Central Committee welcomed the Hamas missile war on Israel in November and said this has dissipated their opposition to sharing power with the Islamist movement. The Israel Army has already detected evidence of Fatah-Hamas coordination in areas under the direct control of the Palestinian Authority. Israeli military and security units have been tracking the resumption of activities by Fatah gunmen who had benefited from an amnesty by Israel in 2007. Israel has arrested former members of Fatah’s military wing in the area south of Hebron. Hamas has exploited the renewed reconciliation with the PA to expand its military infrastructure in areas under the control of the PA. Israel’s intelligence community has determined that Hamas political bureau Chief Khaled Masha’al, has ordered the establishment of military cells to take over areas now under the control of the PA.
Cooperation between Israel and the PA has been linked to a range of political and economic factors, including unrest in Palestinian Arab cities and the fiscal crisis in the PA. In mid-2012, however, cracks began to widen in the relationship between the Israel Army and PA security forces. At the same time PA police and security forces began to harass Israel Army patrols and operations around PA administered cities. Until 2011, PA Prime Minister Fayyad sought to separate security policy from Fatah efforts to win unilateral Israeli concessions on such issues as withdrawal and statehood. Fayyad told security commanders that any snag or stalemate in relations with Israel would not constitute justification for ending either security cooperation with the Jewish state or a robust counter-insurgency effort against Hamas. The price for Fayyad’s demand was Fatah approval for major appointments in the security agencies as well as reform, human rights and restructuring. Fayyad knew that even with control of the purse strings, he could only go so far without provoking a violent backlash by Fatah. However, President Barack Obama did not halt or slow down U.S. aid to the PA – even after it successfully sought non-state membership in the United Nations. Moreover, U.S. diplomats have refused to acknowledge increasing PA civil rights violations, which have been attributed to the PA security forces that are trained by the US. The administration has also opposed moves in Congress to stop funding PA security programs. Israeli intelligence sources report that the PA-Hamas coordination of these squads reflects an agreement between Abbas and Hamas leader Masha’al to spark a war against Israel based on the use of Palestinian civilian fighters. Both men agree that a military confrontation with Israel would be unsuccessful and therefore Hamas and the PA must use civilians and massive protests to drag Israel into a shooting war. This would isolate the Jewish state and bring it under massive international pressure for a unilateral withdrawal from Jerusalem and the West Bank. 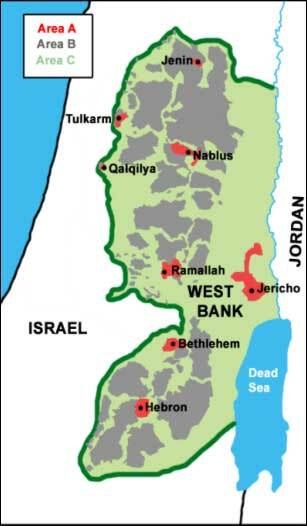 Abbas’ concession was the renewal of Hamas rallies throughout the West Bank. The difference between the 1987 uprising and the next one is that the PA has some 30,000 active troops and another 36,500 on the payroll. Hamas has at least 25,000 fighters in the Gaza Strip and thousands of armed men in PA controlled areas. The prospect that any civil uprising would remain limited to stones or even firebombs appears nil. With Palestinian arsenals brimming with weapons and advanced U.S. security equipment, Israel could find itself fighting a war against Palestinians who are armed, trained, and financed by its greatest ally – the United States. 7. “Fatah Elections May Herald Changes in Palestinian Authority Security Policy” Jane’s Defense Weekly, Aug. 14, 2009. 17. “A Bid: Israel Threatens to Topple Abbas” Itamar Eichner. Ynet. 31. “Bernstein vs. Clinton” Israel Law Center suit against the U.S. government by 24 Americans in Israel. November 2012. The suit charges that the federal government has ignored congressional safeguards to prevent U.S. aid from reaching terrorists. 40. Recorded meeting of Israel Army Col. Nimrod Aloni, Shomron Brigade commander, with Livnat family. May 8, 2011. 55. “Radical Islam in Gaza” International Crisis Group. March 2011. What plans does the IDF have to destroy all of this when the situation calls for it? Have they made plans?